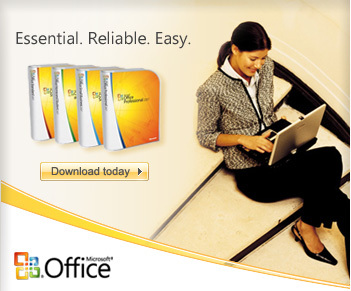 2016 Microsoft Office Professional Plus for $9.95! This is a steal of a deal. Normally it costs $399...yikes. You can use the download link on two computers also, which makes the final price like $5 per computer. If that doesn't work than try NOT entering any code. Some people have had success entering NO code. If you are AIR FORCE....click the blue link that says you do not know the program code and it will send you an email with what you need. I tried with the code first, then without the code... and that is what worked for me. The code 67F2F2491D also has been reported to be successful as well. GREAT TIP from comments below - "Make sure to use your work .mil address and then forward the confirmation email to your personal PC. I have done it for both my Mac and Windows 8.1"
Please comment below your Military branch and if it worked for you. If it didn't work for you give us more details then just "the code didn't work". Tell us your branch, status, email address, and details like you didn't get the email, or it wouldn't accept my military address, etc. and we will try and help. The military also provides McAfee or Norton Antivirus software free of charge , visit our page Military Free Antivirus Software (McAfee - Norton) to learn how to download it. The code for the navy is 67F2F2491D. I just used it and it worked for me. Hope this helps. Using the code above listed here: 67F2F2491D for Navy, worked for me; 11/29/15. I just did it today 29 February 2016 and it worked! I inputed my work e-mail and forwarded it to my personal e-mail and opened it in the computer that I wanted office on. Voila $ 9.99! Done! I would ONLY recommend downloading this on your HOME computer. Don't do this on your military laptop or military work computer or you will likely run into problems. If I'm on a ship and my email has a hull number before the navy.mil (like @cvn76.navy.mil), is there a different code I would need to use. The @navy.mil code isn’t working for me. As of right now, if you have a hull number or something before the navy.mil there is not a way to get the discount. Its stupid and hopefully they fix it soon. any one figure out how to do it with a hull number in your email address? What about Coast Guard? What is our program code? I am active Air Force and I was able to get it by following the af instructions in step 3. Enter your .mil email and click the link that says you don't know your program code. Then check your email and follow the instructions. After you checkout, it will even ask you if you want to send the product key to your personal email. Thanks for the all the good info! I am active Army and I received the email at my mail.mil address, but when I clicked on the link to purchase the download, it keeps stating that it is unable to locate my user account for activation. Any ideas? Did you try forwarding it to your non-military email? Everything worked perfectly. Thanks :) We used our army mail.mil acct. I am a veteran without a military address. 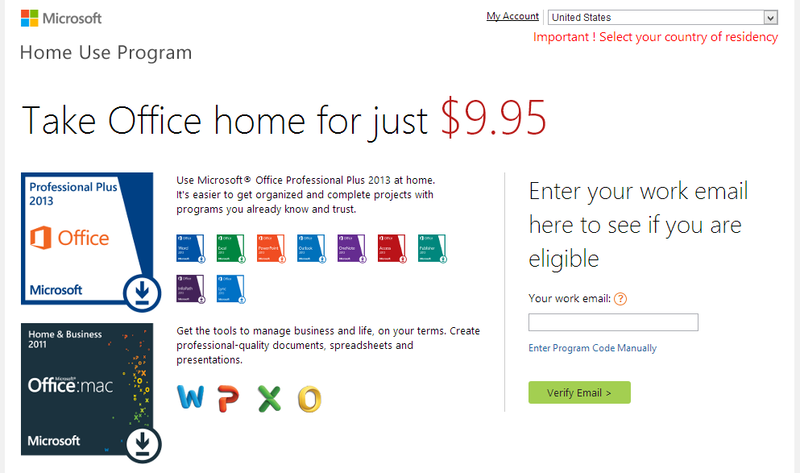 Where is this $62 Microsoft Office, I sure can't find it!! 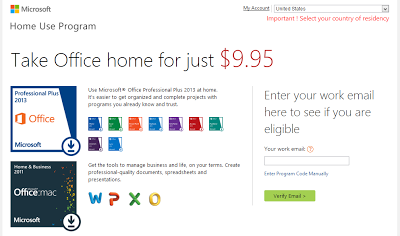 Go to http://www.discounts-deals4military.com/2014/07/microsoft-military-discount.html and click on the link that says "Microsoft Online Store for Military"
That $62 is for Microsoft 365 a 1 yr subscription. Is there a major discount on the full version? Just used this code for Navy and it worked: 22FCF442D2 I have a normal @navy.mil email. I initially used Chrome, which did not work, and then tried a different browser, Safari, which worked with the code 22FCF442D2 mentioned above. Recommend trying different browsers if you are having issues. Thanks for the TIP! I'll add that to the article! I'm a Marine and it won't work with or without the code. I get a red message asking if my email is right and also reminding me to include a code. I have a usmc.mil address, what's the problem? Do you have an updated/current USMC code available? I have been going in circles for a couple weeks and still can't seem to get it to work no matter what is put in or left blank? Just purchased this past week and it worked great! I paid the 9.95, but I also spent the extra $15 to have them mail me a physical cd as well in case I ever had to reboot my computer. Just remember, the link will be sent to your military address and then you need to forward the email to your personal email so you may access it from your home computer. •Please verify that you have entered your work email address correctly. We are unable to confirm your eligibility without a program code. If you still have problems, please contact your benefit administrator to learn if you are eligible and to retrieve your program code. My wife is active army and it worked for us. I think i didn't do a code, just her army .mil address which is ridiculous as far as addresses go. I honestly can't understand how she remembers that ridiculous email address. Id make sure you are typing it in correctly since army email addresses are so stupid now. Also like he mentioned use internet explorer. Id try reseting your browser to default settings, there could be a setting that is incorrect in the internet options. Awesome deal and tip! Thanks for pointing this out. My Enterprise has always had issues and i can not sign in (not for the last year and a half) Helpdesk is useless as is the S-6. Can I use my USASOC email address? My wife is in the Army and we got it to work and we put in a blank code. Just her work email and it worked like a charm. Im very stoked. It has sucked only having Office on one computer and now we have it on 3. Very happy about this. You need to have saved the original email you received the the unique website link and code. Do you have that? Worked for me by using hubby's navy.mil address and no code. Had him forward email to me (at home) and am installing it now. Thanks! Will this work for National Guard? Also works with student email; no code needed. Awesome website! I am with the Air Force and when I enter my email address I do not see a link saying "I do not know the code" what should I do to have them send me the link? I had the same issue. I don't know why everything Air Force has to be the biggest pain in the..... Anywho- Navy seems to get it. I used the code: 44C0707F11 and my mail.mil address and it sent. 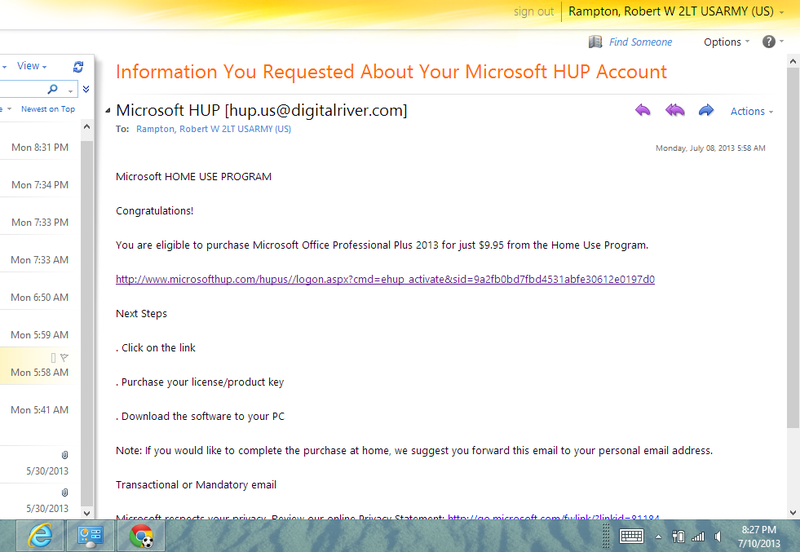 I then got on my mail.mil and fwd the activation to my personal email so I could get it on my laptop. Hope this helps. I am retired Navy but work as a contractor with the USAF. I had the same issue using my mail.mil address (not seeing the link about not knowing the code, and also the error message to verify my .mil address. Upon entering the 44C0707F11 code, it worked for me as well. GO NAVY!! I sent mine to my mail.mil address as well, but I have no idea how to access mail.mil. Does anyone know how to access it? ?Does any know the code for Army personnel? 44C0707F11 <- use this and log into the enterprise email you will have a link there to the HUP store. Tried 44C0707F11 on 16NOV2016 and it worked. If this one doesn't work, try some of the others on this site. I tried 3 before it worked. Good luck! I type my work email in the format as it shows on the steps and I've try the 2 different codes for Navy and it still didn't work for me. Could you please help me out with that? Thanks in advance. I just attempted this using my Air Force .mil email and none of the codes listed above (including entering no code), or codes mentioned in the comments, was working. Do you think there are new codes for the new year? I'm having this same issue for the Air Force email. Site just updated the code (4A82EF7B8F) Worked for me! I just tried entering the ARMY code with my US.ARMY.MIL email address and it did not work! Anyone know a current ARMY code? Does it matter if it is Army National Guard? Still has same email address as an enlisted ARMY person. HELP! I really need this program. Thanks! I actually got it to send the email link! I was using my old army email address. I had to use my .mil@mail.mil email for ARMY and used the code listed above for ARMY! So now I'm about to install it. Hopefully it works! 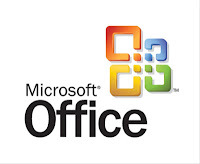 Has anyone in the NAVY had recent success in downloading Microsoft Office and what code did you use? Thanks in advance! Try using code 22FCF442D2. The other codes wouldn't work for me either but this one did. Much Mahalo for the information. We've downloaded this using our Army email and code and everything has worked brilliantly! Just bought two new laptops. Is the code valid for more than one device, or do I need to purchase two software packages? Just used the Army code and is valid. Everything worked perfect. Update for Navy members on a ship, you can do this! I used my email (name at hull# dot navy dot mil) and it worked fine. I then forwarded the install link to my personal email and downloaded it for 9.95 on my laptop. I did not need a code. This information is as of Feb 2017. 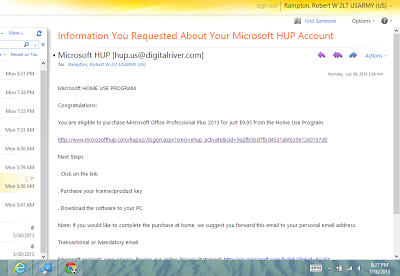 Another tip: After verification of email address, MS hup send you a download link. In the email with the download link that I received, the link itself was so long that my email program only hot-linked half of the address and when I clicked on it, it said sorry... we can't find your page. I had to highlight the whole link and paste it into the browser for it to work. Although it is super-simple, it is really easy to overlook if you are clicking around fast so I wanted to put the tip out there. "Your purchase is complete, but you still need to install your product. Want to install on a different device? Enter your personal email address below to forward your Install link. " Supplemental information, I am stationed in guam but still put US as my country. Army code worked for me! Thank you so much!!!!!!!!! I am active and am 100% positive that I already purchased this about a year ago. I cant for the life of me remember my information to log back in. This is due to a break in school due to work. My question is, how do I retrieve my information to log back into my account? Every time I add my email address it says my email isn't associated with them. I'm I the only one having these issues? I've installed this on a laptop already. Can I buy the "backup copy" and install it on a second machine? Will that work? Thanks! Anyone with a @socom.mil had any success? This doesn't work with enterprise email. is there any other method? Worked for me and I'm retired military but also a military contractor. I used the Army code since I'm on Ft Eustis but working for Joint Staff. anyone make this work with the army code and enterprise email?